New Jersey takes a lot of abuse. It’s been a punching bag for most of it’s life, resulting in some pretty thick skin. New Jersey has heard your joke before and honestly, it doesn’t care. Oh, you want to complain about the Turnpike? So does every other basic person on their way to Times Square. Oh, you’re bothered by a smell? I’ve showered twice this week. One rude comment after the next, New Jersey rolls its eyes and carries on with its day because you just aren’t that creative. Plus, you’re probably from Florida. 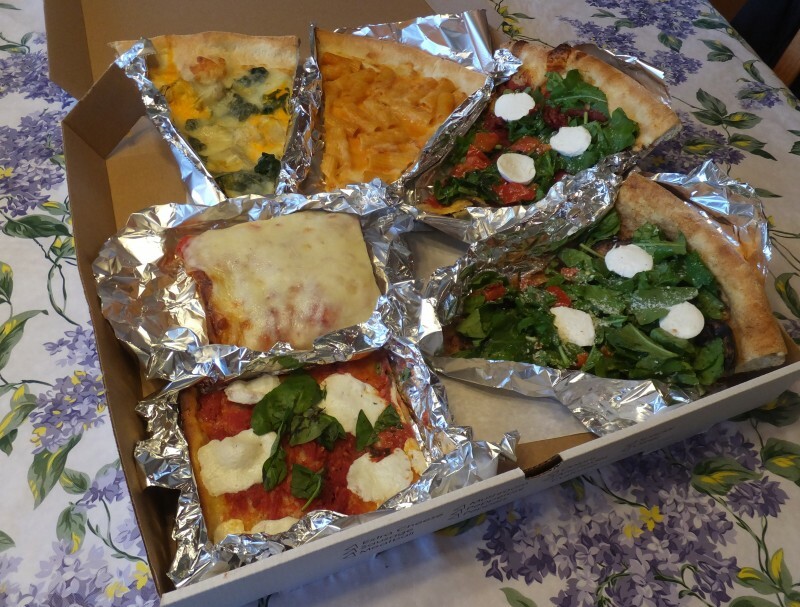 Only after people get bored of slandering New Jersey do they deserve to revel in its treasures: bagels and pizza. No trip home is complete without at least one meal of each. Yes, seeing my parents is the most important part of any visit, but I can talk to them anytime. It is only when I’m in New Jersey that I resume my relationship with the best bagels and pizza ever. Bagels come first, and generally from Sam’s. 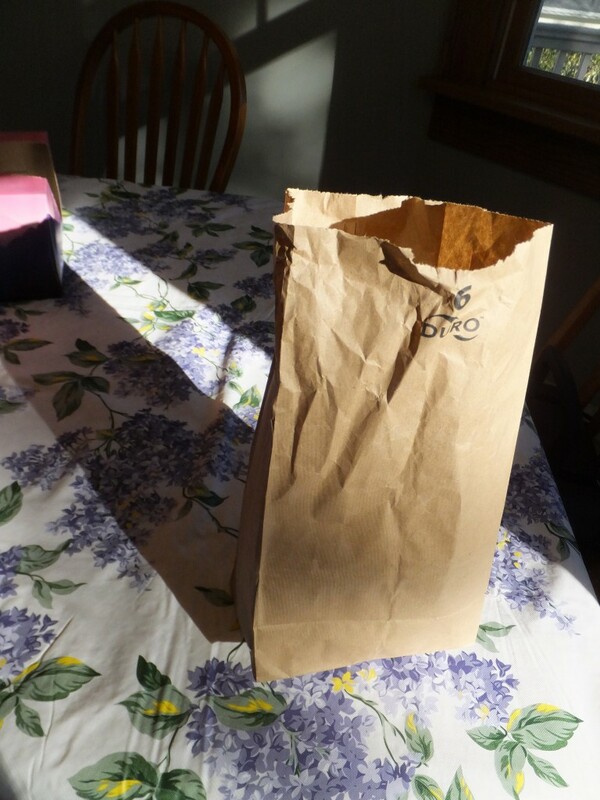 The innocuous brown bag doesn’t normally make it to the kitchen table because I start eating once I’m inside my car and sure that no one from my high school can see me. Open up the wrapping and oh wow, an everything bagel, with poppy seeds, sesame seeds, garlic, salt and pepper. Maybe some other stuff too! “You mean everything to me,” he said, sliding an everything bagel onto the ring finger of his beloved. That’s only the start. Check out the solid mass of chive cream cheese. 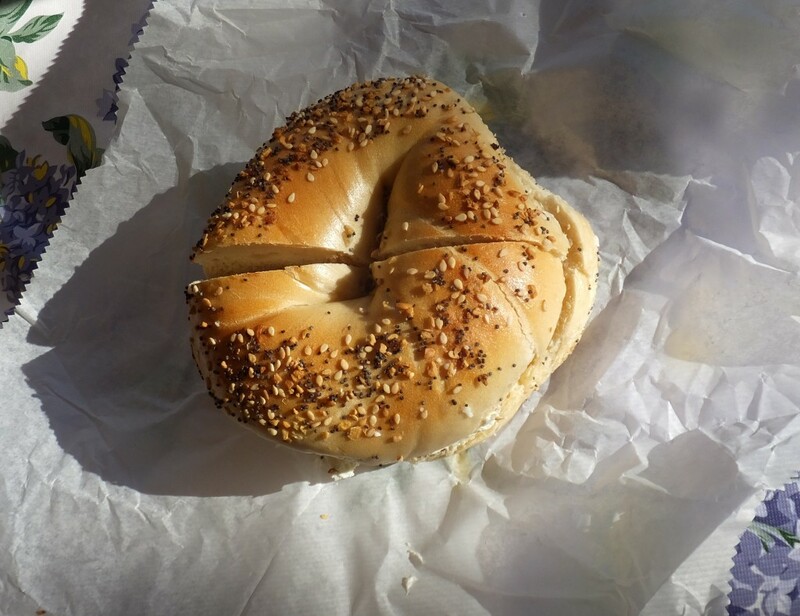 This bagel stands tall, proud of its heritage. Many people would suggest you order a Taylor ham, egg and cheese, but I could eat cream cheese by the spoonful. Even the greatest writer in the history of the world (Mindy Kaling) couldn’t adequately describe how amazing this bagel tastes. Still fairly fresh from the oven, the texture is chewy but not tough. 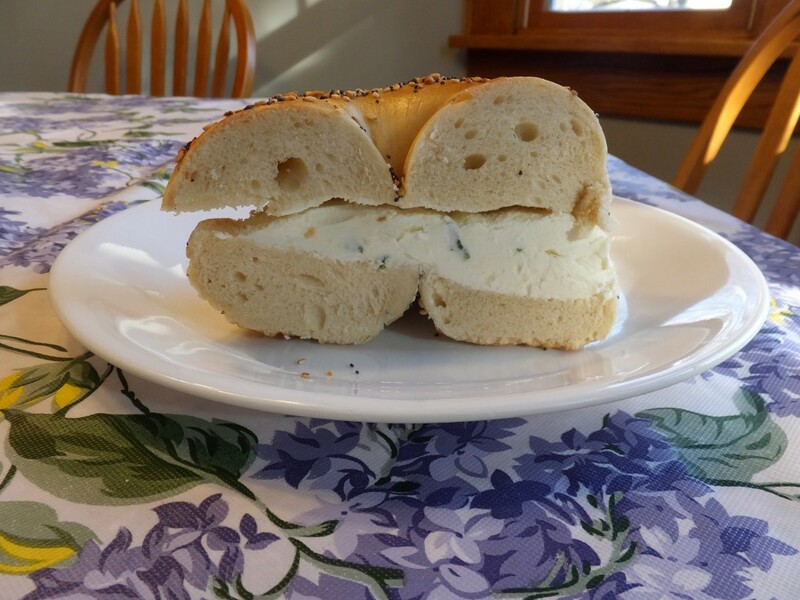 The cream cheese is smooth and rich, which compliments the salty and varied exterior. 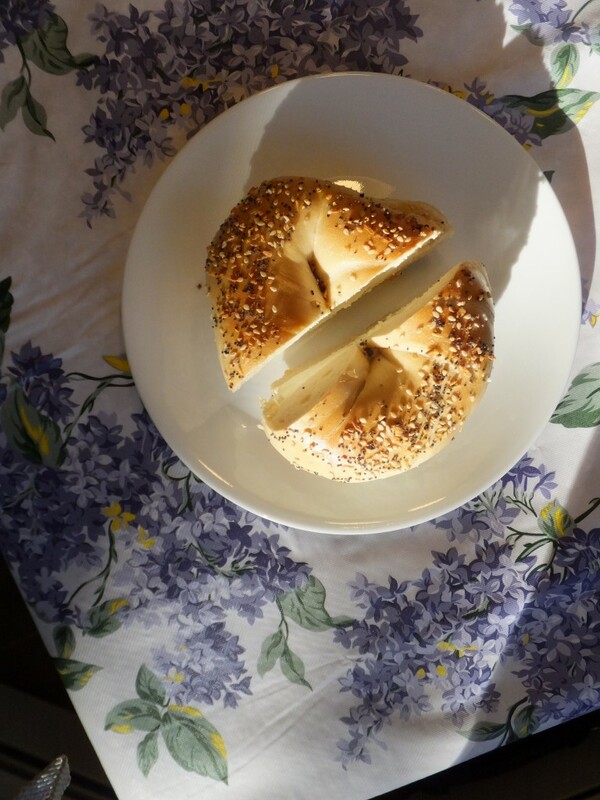 Each bite is perfect and yet imperfect in that it brings you closer to being without a bagel. A few hours after breakfast, it’s time for round two: pizza! A pie of plain is always a safe bet, but I’m tempted by the more creative options. Here is the slew I brought home from Forte’s, moving from healthier to unhealthy. 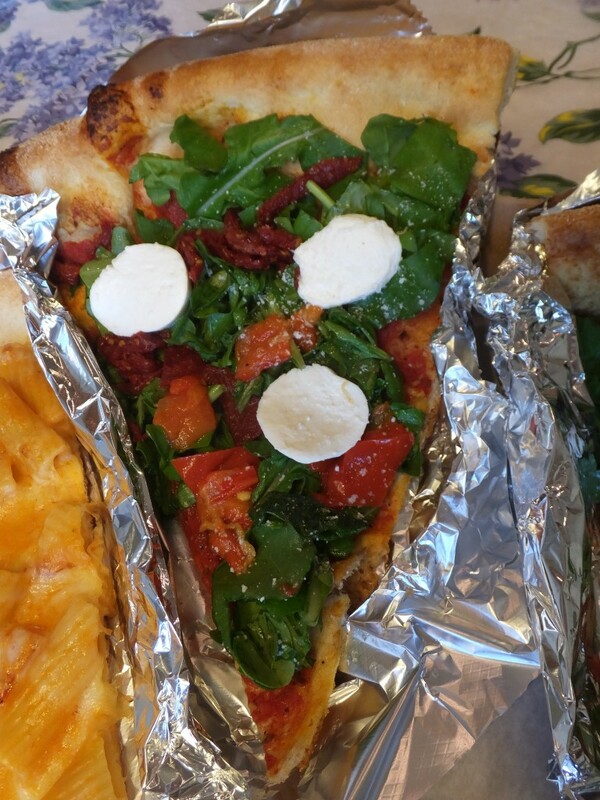 This slice is called Margarita. 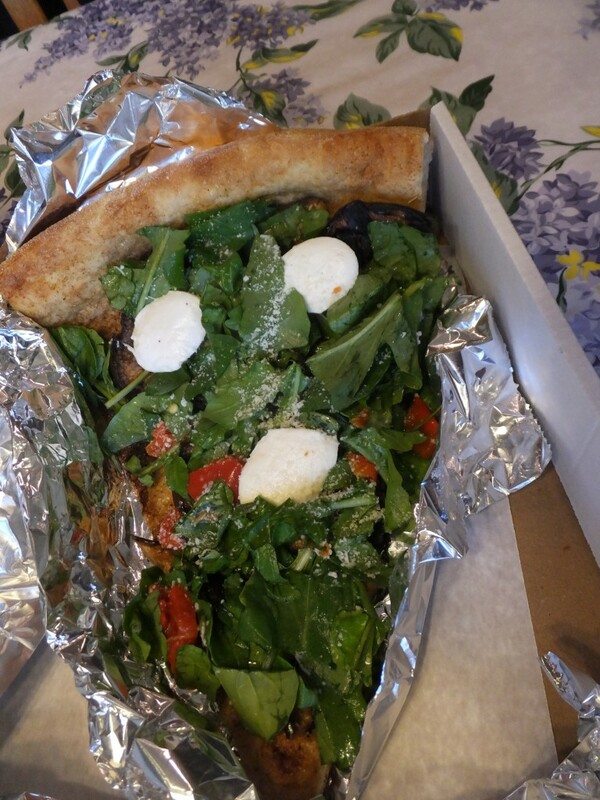 It has roasted red peppers, sun dried tomatoes, fresh mozzarella, and greens. The crust is crisp as opposed to chewy, a lighter selection and a preference for concerned mothers up and down the coast. 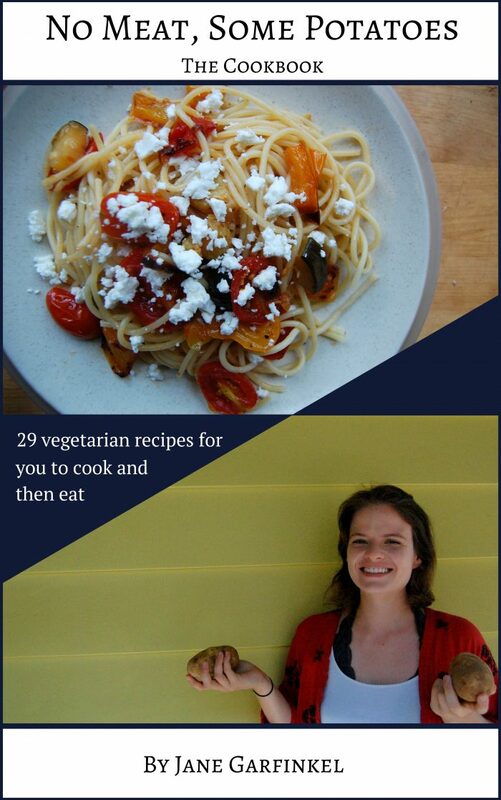 It’s sister looks almost identical, but in fact has roasted eggplant hiding under all those leaves. I’ve recently taken an interest in slices of the square variety. 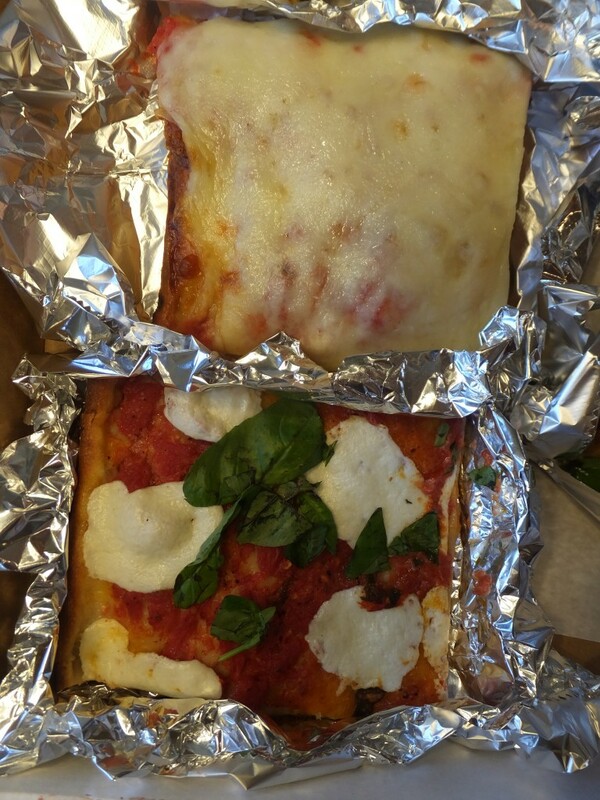 Sicilian pizza is fat, cheesy, and sinful. Once you’re finished you feel like you have a brick of cheese in your stomach because you have a brick of cheese in your stomach. Grandma Style has a thin crust, with mozzarella and basil on a sweet tomato sauce. 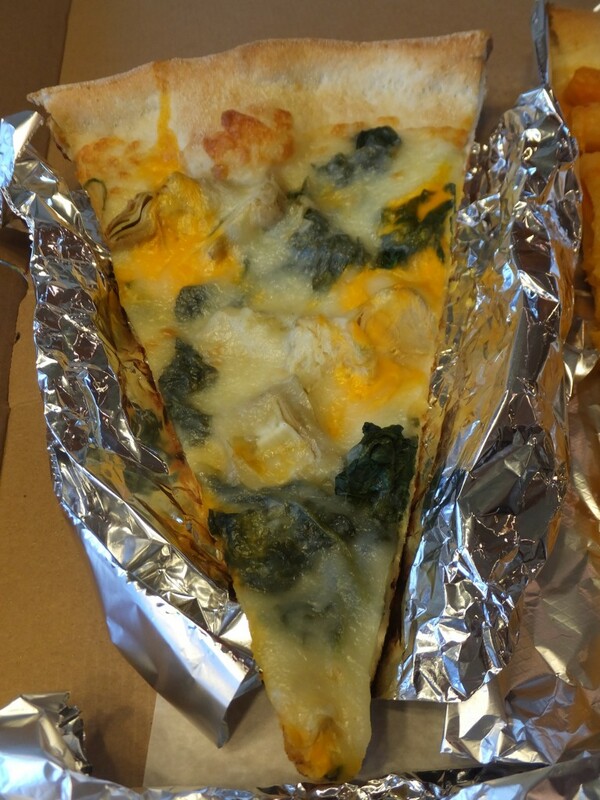 This ones an oddball – Spinach Artichoke pizza. I’ve never seen it before and the cashier had to ask her manager what it was. It was scarfed down by my father so I can’t vouch for it, but it’s kind of cool, right? And finally, the most important, most delicious, most New Jersey pizza: Rigatoni Vodka pizza. 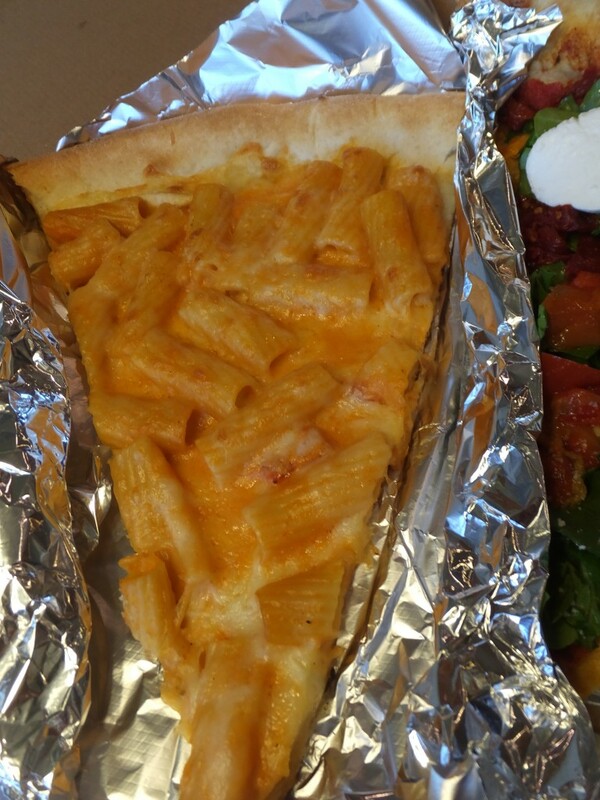 Yeah, pasta on pizza. It’s excessive and amazing. This is the slice that I get every single time I’m home and would be my last meal request if I were ever put down by the state. The vodka sauce is rich and sinks into the crust, while the noodles are perfectly cooked and somehow do not feel redundant. If you visit me in New Jersey, I will make you eat this. New Jersey will continue to be bullied but its confidence will never falter. It’s a state of noblemen, disregarding the governor, beautiful scenery, disregarding the industrial plants, and historical sites, including the home of Grover Cleveland located in my very town. New Jersey has so much to offer, and if you don’t believe me, start with the food. Haha we can take it 🙂 Congratulations btw! It looked like a really fun trip.